With the clocks going forward and the onset of British Summer Time, the curtain came down on the annual gull roosting season at Tophill Low NR, East Yorkshire on March 25th. 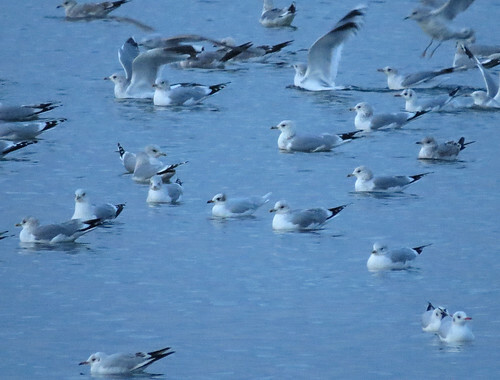 A total of 10 species of gull were noted in the D reservoir roost, O reservoir roost and South Marsh East roost during the November 8th 2016-March 25th 2017 period with more than 100 roosts observed. This was down on the 2015-16 winter in which 11 species were recorded, while the 2014-15 winter campaign saw 12 species recorded. 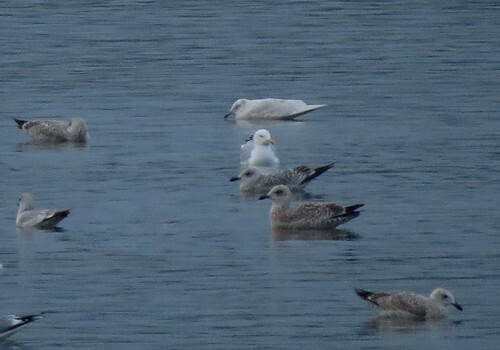 The November/December 2016 period proved to be particularly uneventful, with just a single Yellow-legged Gull Larus michahellis, a minimum of six different Mediterranean Gull Ichthyaetus melanocephalus – including this adult below in December 2016 – with the lone highlight being a 1st calendar year Caspian Gull L. cachinnans on November 20th. However, the January-March 2017 period couldn’t have been more different! 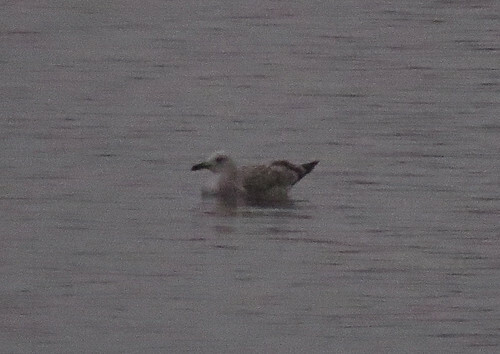 Caspian Gull L. cachinnans the highlight – two 2nd calendar year individuals included this one photographed in poor light on January 7th on D reservoir. The Tophill averages for white-winged gulls since 1981 don’t make for fantastic reading – singles of either an Iceland L. glaucoides and/or Glaucous Gull L. hyperboreus tends to be a good year, anything more than that is a remarkable year. 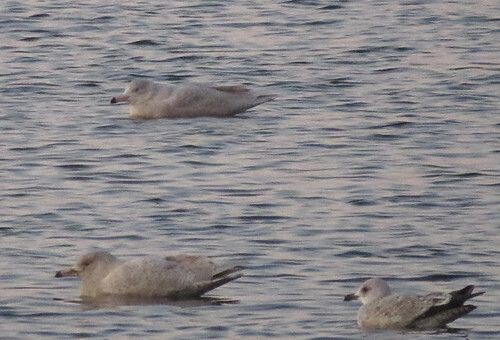 After a review of notes, photographs and videos (which is still ongoing) it would appear a minimum of 16 different Glaucous Gull L. hyperboreus appeared at Tophill Low NR between January 5th and March 25th – an incredible number – the one above on South Marsh East in February, the two below on January 14th – the first time ever two were present in the same roost according to reports dating back to 1981! 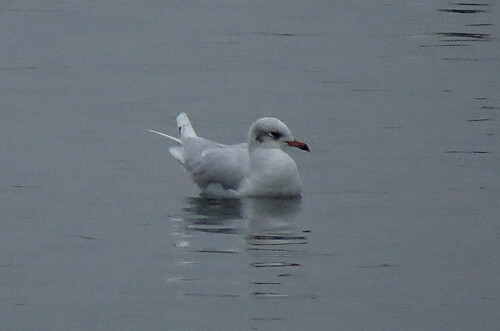 (Please note I currently don’t have records prior to 1981 available) Two were also seen in the D reservoir roost on March 8th, though not at the same time. 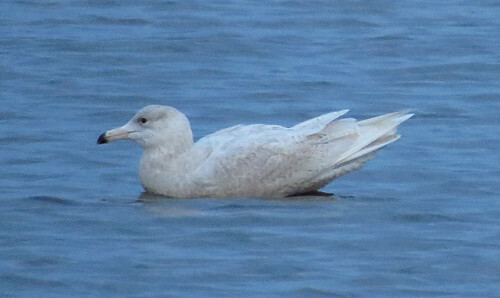 Iceland Gull L. glaucoides also featured with a minimum of four seen during February, equalling the site annual record number of individuals – this total noted in both 1995 and 2001. 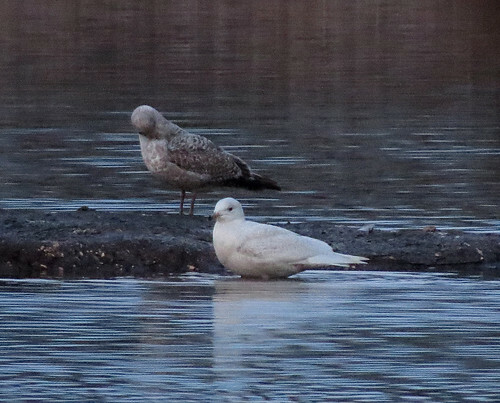 Unusually, both Glaucous Gull L. hyperboreus and Iceland Gull L. glaucoides appeared together in the gull roosts on three dates this winter – the only time this had occurred previously at Tophill Low NR was on December 24th 2001. 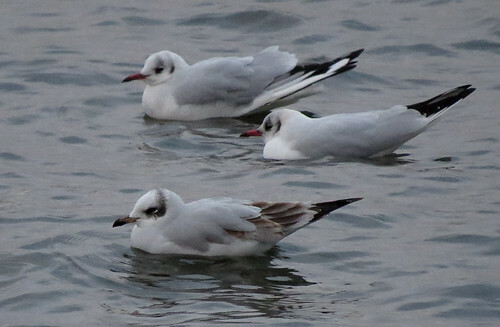 An influx of Common Gull L. canus and Black-headed Gull Chroicocephalus ridibundus in mid-January as a result of southeast winds predictably saw an influx of Mediterranean Gull I. melanocephalus from January 19th, with probably 30 different individuals recorded up until February 19th, with a further three in March, taking the winter total to a minimum of 39 individuals – slightly down on the estimated number of the previous two winters, but still a clear demonstration that the number of individuals is far higher than previously recorded. Once again the record total of six roosting was equalled on January 30th and February 2nd – but the total of seven individuals which moved through D reservoir on September 14th 2014 remains the highest day total ever. Predictably, Yellow-legged Gull L. michahellis were again scarce during the opening quarter of 2017 – a 3rd calendar year bird present on January 17th and a 2nd calendar year on February 20th and 22nd. In summing up, while the target of 12 species in the winter roost wasn’t attained, the period January 5th-March 20th is actually the best ever period for scarcer large gulls in site history since construction in 1959 – the total of 20 white-winged gulls for a winter will stand the test of time and will probably be a long-standing site record. With all the white-winged gulls appearing in 2017, there is also the possibility that further individuals will be seen during this calendar year.